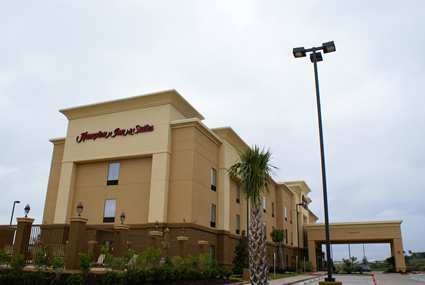 The Hampton Inn & Suites would love to have your business!!! 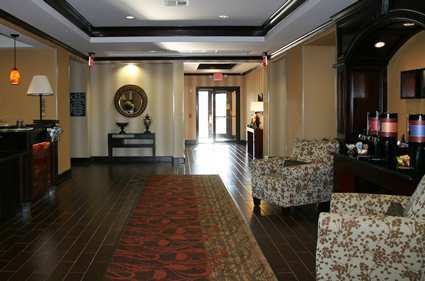 We are the newest hotel in town, with beautiful decor, wonderful rooms, and hospitable staff. One of our many amenities is our complimentary hot breakfast every morning from 6am to 10am. We serve items such as scrambled eggs, bacon or sausage, fresh made waffles, fruit, yogurt, cereal, pastries, etc. The outdoor pool with hot tub is a nice quiet get away. We have a fitness center on site at the hotel that includes 2 treadmills, 1 bike, 1 total body trainer, and 1 elliptical. Complimentary wireless and wired internet is available in every guest room, and wireless is available in public areas and the business center. Our business center has computer and printer access. The hotel also has a mini convenience store with snacks, drinks, and of course Blue Bell ice cream!!! We offer 24 hour coffee and fresh baked cookies in the afternoon Sun-Thur. All of our rooms include a microwave and mini fridge, hair dryer, iron and ironing board, coffee maker, and we have same day dry cleaning service available Monday to Friday. The rooms also have 32'' flat panel LCD TVs. By signing up with Hilton Honors, our guests will receive complimentary newspapers in the morning at their door, and express checkout. We have a meeting room available that accommodates up to 40 people. Our rooms have wonderful Hampton amenities such as Cloud9 bedding, feather and polyfiber pillows, lapdesks, alarm clock with mP3 port, curved shower curtain rods, and fluffy Hampton terry towels. 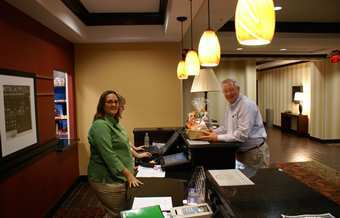 You have a friend in town at the Hampton Inn & Suites.